In the past, the cores of the nave and south porticus have been dated to the C8 or C9 when they belonged to a minster church, but a date as late as c1000 has recently been preferred. In the C12 a tower, chancel in two parts and north aisle were added and the porticus became a porch. In the C13 lancets were inserted and the arcade rebuilt. Bishopstone lies in an unspoiled Downland valley and consists of a few houses and a church. References in early C9 Mercian charters under the name of Denton (recalling the village of that name nearby, though Blair and Pickles identify it with the present Bishopstone) suggest the estate had become Mercian royal property by the time of King Offa (reigned 757-796) (see 12(i) pp17-18) and excavations to the north of the church suggest that buildings in connection with this were in existence by c800 (11 p334). Ecclesiastically, it was closely associated with the minster at Beddingham (JBAA 146 (1993) p45), though Bishopstone appears also to have acquired such a status at an early date. 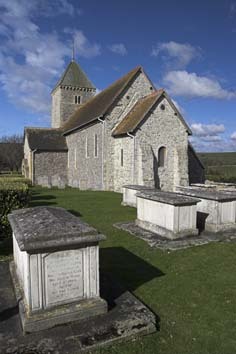 Its only certain chapel was Heighton but its writ may have extended as far as Seaford (2 p49). By the C11 (see 12 pp19-22) the lands were held by the Bishops of Chichester, recorded as the holders of the manor in Domesday Book (3,1); doubtless the change in name to Bishopstone, under which it appears there, was connected. The bishops visited their properties such as Bishopstone when conducting visitations of the diocese and the residence here was substantial enough to allow King Edward II to be entertained here in 1324 (1 p32). John Blair has also produced detailed evidence to support his proposal that the church was the unnamed Sussex minster from which the relics of a minor late C7 martyr, St Leofwynn or Lewinna, were stolen around 1060 by a Flemish monk (12(i) p22). This may well be an indication of the high status of the church at the time. Only in the C17 did the bishop sell his lands (5 p3). The nave walls are tall and under 2ft 6in thick, with quoins of long and short work, well preserved at the west end and on the south porticus, and there has never been any reason to doubt its pre-Conquest origin. In 2006 an original single-splayed north window, now opening into the aisle, was found and has been preserved. It is possible on the basis of this to postulate the number and size of the original windows. To the south a large porch-like structure shares these characteristics and is in fact an original porticus, though placed much further towards the west than those at Worth, West Sussex, the best-preserved example of the type in Sussex. A C12 outer arch that has been inserted in its previously solid wall; the narrow round head of the arch into the church is rebuilt, probably also in the C12, but its position off-centre to the west is likely to be original, since it allowed space for an altar against the east wall (its position marked by a C14 niche – see below). 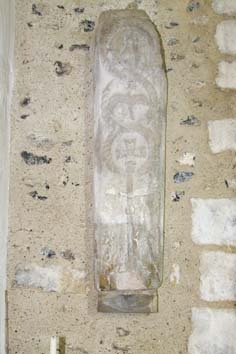 No contemporary window remains intact, but examination in 2006 revealed a blocked one in the south wall above the C12 doorway. Its form is uncertain, since the external side could not be examined because a stone sundial has been fitted in this position. The blocked window confirms that this is not in its original position and though it has been dated to as early as the C9 (see below), it can no longer be relied upon in support of an early dating for the fabric. There would have been a matching north porticus until replaced in the C12 by the aisle, and two further blocked single-splayed windows in the west wall of the nave, now hidden by the tower, have led Gem to suggest that the height of the windows off the ground pointed to there being a western one as well. This is supported by Combes, who proposes a fourth one as well (2 p50). However, Blair (12(i) p29) has found no evidence of a third, let alone a fourth. On the basis of examples elsewhere, Blair also suggests that one of the porticus, more probably the north one, contained the shrine of St Leofwynn. A church of such consequence would have had a chancel and though the present one is later and is as wide as the nave, some walling at the south west corner sufficiently resembles the known earlier work of the nave to suggest it is original, despite the breadth and the lack of detail. The original plan of Bishopstone – a nave with a chancel, north, south and less possibly a west porticus – is characteristically pre-Conquest. The discovery of the original north window in 2006 confirms that the original nave was without aisles. As already noted, the question of an overall dating has aroused great debate. 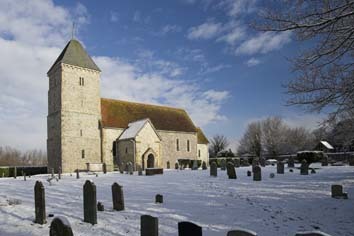 The church was for a long time regarded as the earliest in Sussex to survive. This was based on the detailed conclusions of W H Godfrey (see 5) and seemingly underlined by its early history as described above. Pevsner also inclined to an early date, specifically the early C8 (BE p418), whilst Baldwin Brown (p191) preferred the C10, relying on the long-and-short work. The Taylors committed themselves only to the period 600-950 (p71), though with an implicit preference for a pre-Viking date. More recently Eric Fernie (p149) has suggested a later date, also citing the long-and-short work. The two- or possibly three-porticus plan does not help very much with dating. There are parallels in C7 and C8 Kent, particularly when the porticus is placed so far to the west, but they are still found in indisputably earlier C11 churches (eg Worth). Other recent researchers, particularly Richard Gem (JBAA 146 (1993) ibid), have continued to favour an earlier, probably C8 date, though with varying certainty. However, most recently Gabor Thomas (11 p338) has dated it to c1000. A decisive factor was the discovery that the reset sundial offered no clue as to dating. John Blair has been closely linked to Thomas’s general study of the whole settlement and reaches the same conclusion, basing his conclusions, like several of his predecessors, largely on the long-and-short work, particularly the pronounced horizontals, which he regards as characteristic of the late C10 at the earliest. Taken together with the work in 2006, this represents the most thorough assessment of the dating and in the absence of new evidence, Blair’s conclusions are the most convincing. Since the west wall of the nave is no thicker than the others, it could not bear the weight of the early C12 tower, so this is free-standing. This is clear inside, where its lower east side takes the form of an arch abutted against the west wall, partly concealing the two blocked early windows noted above. The low tower arch is clearly inserted in existing walling. It has a roll-moulded round head and grooved abaci. The unbuttressed tower consists of four slightly receding stages. The external angles of the upper three are roll-moulded, suggesting a change after work started. The openings are round-headed, though those of the bottom stage appear to have been enlarged since the Sharpe Collection drawing (undated but not before 1809). Some upper windows are ornamented, including a circular one in the third stage surrounded by a band of ball-ornament. Above the west window of the second stage a grotesque beast is likely to be in its original position. The paired bell-openings are separated by shafts – that on the east side has a cushion capital. There are grotesques and animals on the corbel-table below the shingled pyramid spire, of which at least the form is probably unchanged. The south porticus may have been converted into a porch because the previous entrance was blocked by the building of the tower. The conversion consisted of inserting an outer arch with shafts (missing when Hussey (p198) wrote and since replaced) and chevron mouldings on the head, which could date from any time after c1120. This is also the date of the north aisle, which presents some puzzles. The present arcade is early C13, yet the original date is shown by the outer wall with a chamfered doorway and small round-headed windows. They are insufficiently impressive to have been reused had the whole aisle been replaced in the C13, so possibly the arcade had to be rebuilt so soon as it failed or conceivably a more impressive one was considered necessary, whilst avoiding needless expense. The aisle is continued as a chapel north of the present chancel, suggesting that this was part of the same campaign of building, though changes of detail suggest it is more likely to be of mid-C12 date. 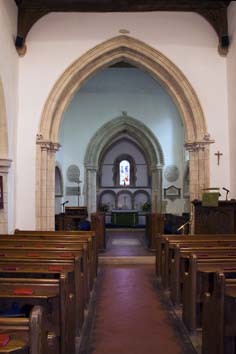 Inside, the choir has double arches on each side; those to the west are roll-moulded, but the eastern ones, more prominent as they were visible from the nave, have chevron mouldings. Between them are shafts with scallop capitals. 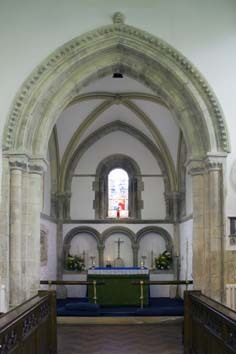 The south arches are blank (until 1849 they contained windows) and the northern ones open into the chapel. The main chancel is as wide as the nave but it terminates in a smaller square-ended sanctuary. The round-headed windows, though now renewed, are unchanged from the appropriate Sharpe Collection drawing, which shows similar ones in the sanctuary. Until 1849, there were two tiers of windows in the chancel of which traces were found in 2006. The round openings in the east gable are original. The arch from the nave into the chancel, like the aisle, raises questions. Its triple shaft responds, stiff-leaf capitals, moulded pointed head and label with foliage stops are late C12, yet it would be odd if no arch had been built during the mid-C12 which is the presumed date of the main work. Possibly an earlier chancel arch was kept for a while or, as may have happened with the north arcade, unforeseen structural problems made more reconstruction necessary than intended though that seems unlikely after such a short time. The present arch is related to that into the sanctuary, which is also not entirely straightforward, though there are too many similarities between the two for it to have been added as a separate undertaking so both must have been planned together, to create an impressive sequence. The scallop capitals on the eastern arch look earlier (implying the choir was built from west to east, as was normal), yet the dogtooth moulding on the head is later. Pevsner postulates a C13 remodelling (BE ibid), but overlapping motifs, common around 1200, more probably account for the discrepancies. Restoration has obscured the previous appearance of the sanctuary inside. The corner shafts with waterleaf capitals are original and demonstrate that though the vault is a reconstruction, one was always at least planned. Also reconstructed, probably correctly, are the string-courses; that on the south side has chevrons and the others are plain and rounded. The circumstances leading to the building of the early C13 two-bay north arcade have been discussed. It has a round pier and matching responds, all with water-holding bases and two orders on the head are only slight chamfered. 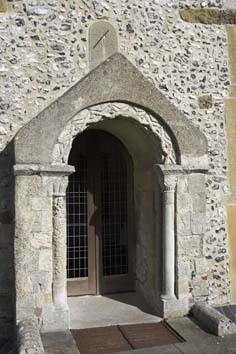 Two of the three south lancets of the nave are likely to date from the same time and the porch was further altered in the C14, with a new niche (see below) and a small, shouldered opening in the west wall. Some roof-timbers look C15, but until 2007 there was no other sign of later mediaeval work. In that year two blocked C16 windows were found in the chancel and have been preserved (13 p12). Post-Reformation changes included a south nave window, which looks C18, in the Burrell Collection drawing and flat plaster ceilings, as shown in a drawing of the interior of 1820 (1 p35); that over the sanctuary replaced the original vault completely. The massive buttresses of the north aisle probably also date from this time. There were three restorations, first in 1848-49 when the sanctuary acquired its present form, with a ribbed vault of timber and plaster, which looks surprisingly convincing. The east wall is original outside, but inside the wall-arcading and shafted rere-arch of the east window are new. The lower choir windows were blocked and those above received pointed heads. Some nave windows were also replaced. The authorship of this work is not known, but W Figg, whose article in SAC 2 (see 4) reveals a close knowledge of the work done, also produced a plan and elevations of the church dated between 1846 and 1848 and was clearly associated, though only the carpenter responsible for the repewing is known by name (ESRO ACC 3412/1/103 and ACC 3412/3/528). Figg was not an architect, though he was a surveyor and land agent. More work is said to have followed in 1860, of which nothing is known, and from this time at the latest, the main body of the church was left in sound condition, despite certain imperfections. E Christian set out to remedy these and complete the work at the third restoration in 1885 (6 p168). He set out his recommendations in a letter to the vicar in the previous year (quoted in 1 pp67-69); most of the church was in reasonable condition, but earlier restorations had not touched the tower and the porch/porticus, so the main work was concentrated on these. Christian noted in particular that the masonry of the tower was much decayed and that its spire (‘roof’) needed to be replaced. Without saying why, Christian believed the original spire had been a broach, but in the event the previous pyramid-form was repeated. Among other defects in the porch he reported that the shafts of the outer doorway to the porch were missing. As regards the interior, Christian’s main intervention was to the roofs. Many early restorations, particularly in the 1840s, failed to remove plaster from ceilings and Christian advised this should now be done. The structure of the nave roof was in his view C15 and though decayed in places, was capable of repair. The others were of poor quality and were to be replaced. Otherwise, work to the interior was slight, consisting of little more than relocating some fittings and repairs to the plaster (‘stucco’) on the walls. The restoration proceeded as proposed though there was one surprise when in the course of his work on the south porch the C14 niche in its east wall was discovered (see below) (9 p374). Further repairs were carried out between 1952 and 1954 by W H Godfrey and W E Godfrey (ICBS), an instance of father and son working together. 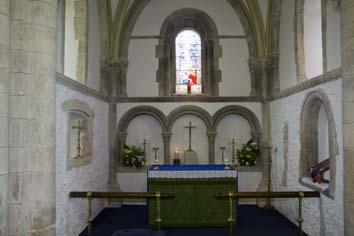 The east quoins of the south porticus were renewed in 1984 (vidi) and the work of 2006-07 included the significant discovery of the early windows in the north nave, chancel and south porticus. On the same occasion the vestry was extended. Aumbry: (Sanctuary) C12. Roll-moulded and unusually large. The size has led to the tentative suggestion that this was an Easter sepulchre (12 p12), but the date makes it more likely to have been an aumbry, which was larger than usual because of the significance of the church. Font: C12 with a plain square bowl on four corner shafts and a thicker central stem. Except for the corner shafts, the stone has been identified as Eastbourne stone (A K Walker p92). 1. W Warrington, 1844. Scenes from the Life of Christ (these cannot be identified and may no longer exist). 2. (South nave, first window) J Powell and Sons, 1905, designed by J W Brown (Hadley list and Order book). 3. (South nave, second and third windows) Clayton and Bell, c1876 and 1896 (www.stainedglassrecords.org retrieved on 4/2/2013). 4. (North aisle, second window) J Powell and Sons, 1929, designed E Penwarden and —- Coakes (Hadley list and Order Book). 1. (In tower) C12 stone coffin-lid, found in a cottage in the parish in 1849, being used as a chimney-piece (church guide). It has three roundels, each surrounded by rope-moulding. 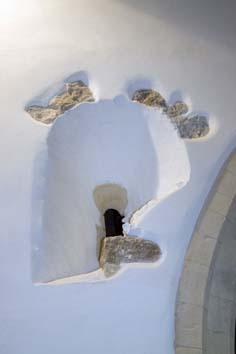 In the lowest is the head of a cross, which continues to a stepped base at the base of the stone. In the centre one is the Agnus Dei, a lamb holding a cross, and the top one has two stylised birds drinking from a tall urn. The last appear purely decorative. The stone is thought to be local. 2. 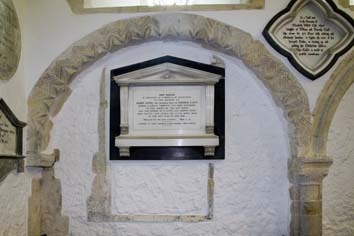 (West wall of tower inside) Worn grave-marker with a rounded top and bearing a splayed cross. In this case, the stone has been identified as the same as the sandstone used for the quoins of the nave and porticus (12(ii)) and it is likely to date from the C11. 3. (South porch, among architectural fragments) Pre-Conquest stone with interlace (now missing) and a C13 tombstone with a floreated cross. Niche: (South porch east wall) This is mentioned above and marks the position of the altar originally in the porticus. It is characteristically C14 with an ogee head under a crocketed canopy in a square surround with fleurons. It shows that the altar continued in use well after the porticus had become a porch. When uncovered in 1885, there were still traces of painting (9 ibid). Piscina: (Sanctuary) damaged but probably C12. It was uncovered in 2006 (13 ibid). Paintings: (West wall) A fragment uncovered in 2006 consists of zigzag patterns..
Sundial: (South porch above the doorway) It marks the main times (9am, 12, 3pm and 6 pm) with lines ending in crosses. The name EADRIC is prominent and earlier writers, e g Green (7 p508), identified him as a C10 earl. This is fanciful and Tweddle would place it somewhat earlier, possibly before the C9 (p41). In the most recent assessment Combes concurs (3 p10), but Elizabeth Okasha preferred the C11 or C12, though earlier than the doorway beneath, and she cannot have known that the dial was reset.